This is a more unbound thread to bring activity back to the Imperial forums while promoting interesting discussions of the Empires past. This is a thread that will be occasionally updated with interesting facts about the Empire and it's past. Since the Empire is close to 3 years old we have accumulated quite a lot of change over a wide period of time and many current members will have been unaware of how things have changed for the better, and what interesting parts loom in the Empires past, we will be looking at original artworks, such as the original design of the Destroyer, Fighter and even the hints of the Royal Destroyer that would drift from time to time. Do remember that these events and designs have heavily changed over time, some of them have been cancelled outright if they are not already unrecognisable. 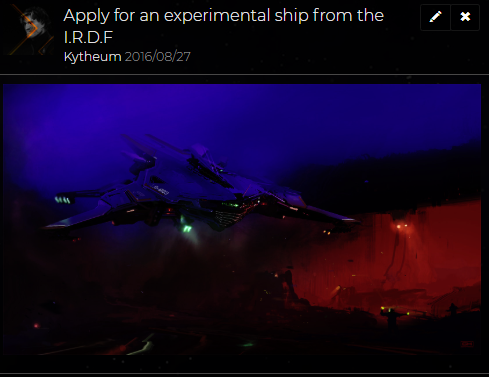 The Ordinance program has gone through many changes during the Empires history, starting as the I.R.D.F (Imperial Research & Development Facility) It was originally a planned construction that would develop experimental weapons and designs for the Empire. The I.R.D.F had it's first director, Director Creen who created the vision for the I.R.D.F with it eventually being taken over by the now Director Almond and turned into the IRD (Imperial Research & Development). The IRD was integrated heavily with the Empire even being considered a part of our core hierarchy. The IRD later merged with the ICY (Imperial Construction Yards) which had just renamed itself to the IAD (Imperial Advanced Development) The IAD specialised in construction and mining and would serve the Empire by providing military assets for the Empire, while the IRD would research and design weapons. Not too long ago the IRD-IAD division merged to form the Ordinance program and officially separate from the Empires hierarchy simplifying everything as now any member of the Empire could join the program and it would act as a permanent project/assignment. The Ordinance program today has two leaders. Director Almond and Director Turray who both specialise in different fields within the program.